It’s true to say that I haven’t done much musically over the past few years. However I have still been very busy in the music industry. Back in 2009 I decided to start my own label for self-releasing but when approached by a number of other artists for help with their own careers, I ended up with a full-blown distribution company which I then whittled down into two distinct labels, for singer/songwriters and urban releases. While it’s been a wonderful journey running the labels and I’ve met many fantastic people within the industry, it has also been all-consuming, eating into my time, energy and resources. I started to become known in the biz as someone who owns a label rather than as an artist and was being approached by more bands and artists asking if I could assist them in releasing their own music, rather than asking if I’d like to do some session keyboard work for them. While fun, it wasn’t creatively fulfilling and certainly not where I’d intended my career to go when I started out, so as a result I have decided that it’s time for big change. My official association with AudioFile Records ended on July 31st this year and I’m in the process of handing it over to new ownership. It will take me a couple of months to extract myself completely as pretty much every website I’ve signed up for over the past eight years has been in my business name, lots of tedious admin to work through! I’m so grateful to the artists that joined me on the journey and wish them every success in their own careers, they’re hugely talented and I hope that they do well and we have the chance to perform together in the future. Running a label has given me a deep insight and appreciation of how much work goes into an artists career and I shall be sharing my experiences with you via various resources. If a label offers you a 50/50 deal then I can tell you first hand it will be well earned on their part – it takes a lot to market an artist and to maintain all of the memberships and contacts required to successfully launch a career in music. In no particular order, these are some of the artists who have either influenced my career or their songs have had a huge impact and made it into my favourites list. This is far from a complete list so I may have to do another one at some point! Who could fail to be entranced by the vocal virtuosity of a voice that sounds like runny honey. I was introduced to the ‘pop’ music of Ella at a very young age and although I became a lover of Jazz, was never such a fan of the darker tones of Billie Holliday. 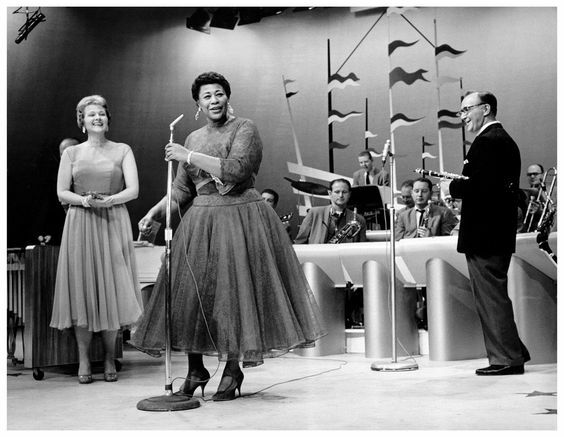 I especially love the combination of Ella’s voice with the songs of Cole Porter, perfection. Thank goodness this wonderful lady was given a chance in the music industry despite a difficult start in life. Tori burst onto the scene in my teenage years, not long after I started playing piano. In her early career Tori Amos had an absolutely mesmerising presence and beautifully fused her classical training with contemporary songwriting. Here was a female virtuoso that a teenage girl could look up to. It was all about guitars at the time so having a mainstream pianist to emulate was a big deal and I spent many hours trying to learn her songs. Alanis was another artist that arrived on the scene during my teenage years at a time when there were so few female artists to look up to. Finally we had an Indie artist instead of the usual stream of Pop singers. Her songs were perfect for expressing teenage angst and I still feel that every song on ‘Jagged Little Pill’ is a classic. That album got me and countless others through some tough times. OK, strictly speaking I got into his band first although he has turned out solo material since. However he was one of the biggest influences during my early career and maybe the reason that I developed a love of funk. Although very mainstream in the 80s, listening to earlier recordings taught me a lot about arrangement and the space between notes being just as important as the notes themselves. Mr Lindup is the main reason I own a Yamaha KX88 and why in the early days I surrounded myself with banks of keyboards and modules. I actually picked up my first keytar before discovering Patrice Rushen but then found that I had the perfect role model. Back then she was doing mainstream pop without sacrificing the funk levels and musicianship, something that I tried to emulate in our early Back2Funk shows. Her skill level on the piano now is phenomenal and she’s a highly respected jazz musician amongst her peers. I might have discovered the world of Funk via mainstream chart bands and artists but when I started to delve deeper into who had influenced them, I began to discover the greats. Herbie could turn his hand to traditional Jazz, Funk, Fusion and Hip Hop with ease and as a keyboardist I was fascinated with this discovery of new techniques and tricks that could be used. Cue many years spent learning chord substitutions, Lydian, Mixolydian scales, etc. As a keyboardist / vocalist, Stevie just had to make the list. He’s influenced countless musicians of all genres, whatever instrument they play, due to his prolific songwriting skills, musical talent and studio production expertise. Stevie’s work has spanned generations and he can still turn out relevant music today. One of my all time faves, Bev is a nice girl from the West Midlands with a powerhouse voice. Back in the day when I first started getting into the local funk scene, she would be heavily played on pirate radio across the Midlands and friends would get me to listen to her tracks. I became hooked on her debut album ‘The B Funk’ and ‘Flava Of The Old School’ rooted itself in my head for years after. At the time of stumbling across Stefanie Sun’s music I’d grown really bored of the usual output from the UK music industry. My first trip to Hong Kong resulted in the discovery of the KTV music channel (much like MTV in the days when it played music but also with lyrics for singing along). Despite not understanding a word in those early days, I was blown away by the arrangements and beautiful melodies and ended up buying all of her albums. There’s always at least two stunning songs on each album (often many more) and I have more favourites than I could name in a Top 10 list. Her use of falsetto is also gorgeous – definitely an artist worth listening to. Another West Midlander on the list, Scott is a fantastic songwriter and vocalist that deserves a lot more recognition than he gets. I first encountered him at a small, intimate gig before he hit the big time and instantly knew he was going to be a success (in fact I offered him a deal on the spot but you can’t compete with the likes of Island Records!) Scott has a voice and fingerpicking style that harks back to the era of Robert Johnson. His debut album and especially the track ‘Elusive’ will probably never leave my Top 10 favourite tracks of all time, it’s just stunning. Happy Chinese New Year everybody!!! After a false start on a few projects in January, I’m finally ready to get my next releases underway so what better time than the start of Chinese New Year! I have four main projects to work on this year, including another solo album, some collaborations for First Stryke Records and also recording a few covers and making accompanying videos for my youtube channel. In addition I have a number of pieces to work on for short movies, adverts, etc. My roots lie in funk and so this year I’m embarking on a dream project to create covers of all of the favourite funk songs that have inspired me throughout my career. The aim of this project is to play most of the parts and create an accompanying youtube video for each track, one a month. Had a great time in MeiZhou this week for (inter)National Day celebrations, thank-you to everyone that came up and spoke to us, you made us feel really welcome! Enjoyed all the dances from around the world too, the costumes were fantastic! This week Atheen was part of a band performing at the opening of a new Ochirly / Trendianno store in TaiKooHui, GuangZhou. She performed with guitarist Richard, bassist Ben and percussionist Jonny and the band had a great time keeping the crowd entertained with a few well known songs. Atheen had a busy week performing with girl band Seasons on CCTV and also at The Golden Phoenix Film Awards, Qingdao, where she missed meeting her idol Jackie Chan by just one day. She also managed to fit in a couple of performances in Ordos and Luoyang before heading back to Hong Kong for a short break. In addition to looking for performance opportunities, Atheen would also like to team up with local songwriters wriiting in Mandarin and Cantonese in order to create some original songs.